My camp has been using a very effective greywater evaporator for the last couple of years. We never had the need to evaporate more than 30 gallons a day - but it easily handled that load. We used another small pump to move water from the shower to the pool. Some improvements for this year may include a small sump for the sump pump and gravity feed lines from the shower and sink. This evaporation project was realized by my ingenious campmate: El Subcomandante Marcos. I like it! What sort of pump does that require and how much power does it consume? The water looks pretty clean - are you doing some sort of filtering before it goes into the pool? I'll get the info on the pump size and power usage and post it back here. It was not a large pump. That water is coming straight from the shower - we didn't do any filtering. We camped a bit down the street from this evaporator wondering why it didn't run very often and rarely at night. We assumed it was because the water evaporated so quickly. I recollect it running while the Genny was on for another purpose. Looked like a great idea. I was impressed. I wondered how to make it without using a nonrenewable energy source. Maybe a wind powered pump. "The sump-pump in question is a marine grade, 4.8 amps. at 12 volts D.C. It is rated at 1500 gallons per hour at zero head. This is about right for this design, however a 1000 gph pump would work almost as well." The pump ran off battery power for a few hours a day at most - it's capable of processing a lot more water than we needed for our camp of 4 (and a few of our neighbors). The warmer and dryer the air - the better it works. I don't think it would be nearly as efficient on those cold Playa nights. What if... and tell me if this is silly... you used a cable (or rope) spool (one of those wooden ones) with the open center hole, and built a windmill-style gig to a shaft to drive a pump at the base of the spool (where the water is), run the pump outlet to the top of the spool and from there it cascades like the one in the pix ??? Maybe have some kind of backup pump setup if it stays calm for a day or 2... but this seems like a natural fit. Comments?? We've had a little discussion about a wind driven pump for the evaporator - (I think the folks at Astral Headwash may have had some sort of wind driven thing going last year). Another thing we've considered is a wind driven generator that would charge a battery that would drive the pump. The difficulty for my camp is getting an individual to take on the project and make it real! We have a big generator that we use to power a spotlight and charge up the batteries so a wind powered system is not on the critical path in our camp. I hope we'll get there some day though - It would be a great thing to power the camp using only the wind and sun! BTW, I believe the proper name for the wire material is "Hardware Cloth", not chicken wire, which has hexagonal "cells", not square, and the wire used in chicken wire is pathetically weak and could never support what's in the picture above. And, what a beautiful design! If the wind would mess up the 'hood, just turn the thing off! Those numbers seem about right for a 75-watt solar panel which would be about the same size as the plywood, is already black, and would benefit from being cooled. You guessed it right! When the wind was strong - we didn"t run it because it would have soaked the neighbors.We did set it up on a tarp which kept the overspray we did have from creating a big mud muddle around the evaporator! Megaflow wrote: when the wind kicked up did the evaporator soak your neighbors or get the playa wet? It looks like a great design. I was just wondering how well the chicken wire held the water in the wind. Hardware cloth ! I knew chicken wire sounded wrong ! DoctorIknow wrote: BTW, I believe the proper name for the wire material is "Hardware Cloth", not chicken wire, which has hexagonal "cells", not square, and the wire used in chicken wire is pathetically weak and could never support what's in the picture above. 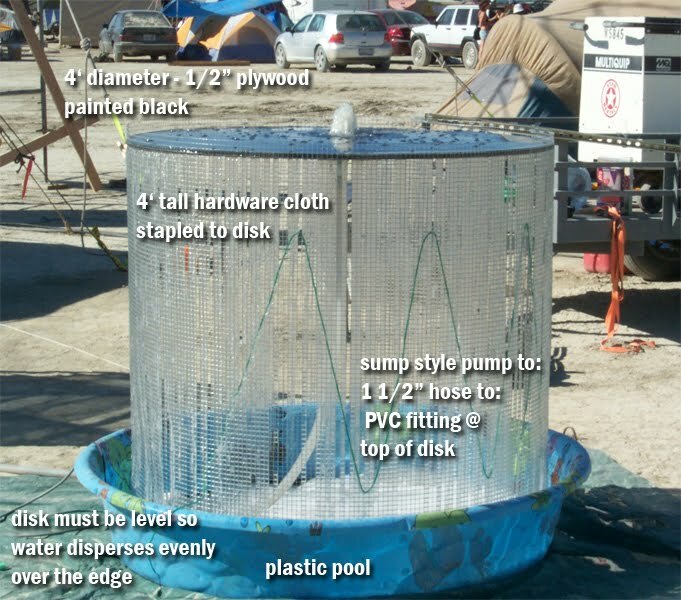 Mr. Polando wrote: My camp has been using a very effective greywater evaporator for the last couple of years. We never had the need to evaporate more than 30 gallons a day - but it easily handled that load. Is that EL wire hanging off it?? I'm building a smaller version of this currently. I'll post some pics for ya to see once it's done. Why is there so much water in it? Was this at a time when you had just taken some big shower(s)? It seems like a LOT of water... how many people are we talking? Also, is the board attached to anything, or does the hardware cloth stand on its own? Finally, is the tube sealed against the board where it protrudes? Re: Why is there so much water in it? "Was this at a time when you had just taken some big shower(s)? It seems like a LOT of water... how many people are we talking?" We had 4 campmates and a few of our neighbors using it. We only ran it when it had a lot of water in it - it didn't run that often and at no where near its capacity. "Also, is the board attached to anything, or does the hardware cloth stand on its own?" The hardware cloth is stapled to the edge of the plywood disk and stands on its own with no additional support. We had a piece of 1/2" rebar shaped into a circle and zip-tied at the bottom of the hardware cloth to help retain its shape - it may not be required but certainly made it more robust. "Finally, is the tube sealed against the board where it protrudes?" No - the fitting we used had some sort of theaded plates on both sides of the plywood to keep it from moving around but we didn't do anything to seal between the fitting and the plywood. when the wind blows, automagically. pathogen source for camps around. Lots of microdroplet dispersion. retrosurf wrote: The whole setup is not sanitary, however...Lots of microdroplet dispersion. ITYM: "The whole event is not sanitary..."
Hey, we were camped directly across the street from y'all (Camp Armgeddon). We didn't notice this little wonder though until Monday right before it was taken down (it was blocked from our view by a big vehicle), but we came over to admire the handiwork. I've been trying for 2 years to come up with a better way than an evap pond, better even than the BRCMUD in 2003. You guys nailed it: hats off to you! If we have a big camp again, this will be our method. And yes, all that is required for "sanitation" is some bleach. In general, 1 cup will effectively treat a 5 gallon bucket. As for the sanitation levels at BRC; we all could use a little more bacteria in our lives, and if that's your biggest worry at BRC, you're not having enough fun! I agree, I think you've got 'it.' I was going to do something similar last year, but didn't think it would do more than 8-10 gallons - so I did something more complex, power hungery, and high maintenance - never again, lost too much fun time. Your design has great execution with the round design. With the pump size you specified, I'm ready to go. I'd like to get a 40W pump (yours 4.8A at 12VDC is around 60W) cuz then we could run it off of a 'cheap' $200 45W solar panel. We'll need to run ours as much as possible, with 55-60 gallons per day to evap during our peak population of 30 people. What we don't evap, we'll truck back. We used to dump a lot of grey waste, but that is frowned upon by the BLM (in the new 5-year permit as an issue to watch). As long as we save some weight for the return trip we'll be happy. Thanks for the info, there will be one more of this design on the playa this year!! So I have a pump question. I no nothing about pumps, but I was curious about the size and amount of water and whether you could get away with a lot smaller pump for 30 gallons a day. The one you said you use pumps 1500 gallons an hours. At the height of 4 feet is is probably pumping half that. But with 30 gallons in the base, it is recycling through that water at least 30 times an hour at its max. I have seen smaller pumps for outside ponds that move 500-900 gph. Even at 500 gph, that should be fast enough to move enough water up so that the whole structure stays wet, correct? Or I was wondering if it was more the ruggedness of the pump you use versus the garden pond pump, though the garden pond pump is also made to run all the time. I just found a 12 volt bilge pump for just under $25 including shipping by ground. There are a several pumps to choose from for differing gph pumped and electrical use concerns. The pump I purchased is a 500gph model. motskyroonmatick wrote: I just found a 12 volt bilge pump for just under $25 including shipping by ground. Damn... looks like there's going to be a small army of these thing out there this year. I'm building one too with slight modifacations. Using normal metal screen instead of the hardward cloth and it will stand on 3 PVC legs in the catch basin. I'll post some pics once it's done and tested. We need a name for these things so Mr. Polando and El Subcomandante Marcos are suitably honored for freeing us from the tyrany of ineffective evaporation ponds. Suggestions? The 1500 GPH pump we used last year seemed to be perfectly matched to the size of the evaporator. El Commandante thinks a 1000 GPH pump would be almost as effective. The year before the camp used a smaller 2' diameter design that was not nearly as effective. I think some experimentation with this basic idea will yield an even more efficient design. [quote="zimri"]So I have a pump question. I no nothing about pumps, but I was curious about the size and amount of water and whether you could get away with a lot smaller pump for 30 gallons a day. I have this 380 gph bilge pump lying around that I'm gonna use. The spec sheet says it'll do 300 gph at 4'. I'm going to use langscape fabric instead of steel fabric. I believe that maximizing the evaporative surface area is how to optimize this, not the flow rate per say. That is, although I'll pump slower, I'll "hold" the water in the sides longer. Of course, if the fabric is too tight, the breeze won't blow through it and you'll actually diminish the evaporative effect. Of course, I'll report my results - and the parade of evaporators is a great idea. There was supposed to be a parade of domes last year and I either missed it or it didn't happen. I thought about re-using a 12-foot tall fabric-holding tube frame (think aircraft) to stretch the landscape fabric over and let the water cascade down - but bilge pumps don't have good lift. The good thing about bilge pumps is that they have low power consumption, so I'll try to work that one. My last year's mist cannon needed tons of power!! This is an impressive little evaporator. It has over 100 square feet of evaporation (by my calculation) in a small little space and based on my experience will actually operate more efficiently than 100 square feet of black plastic. I also got a chance to see this little gem (but not in operation). And it sparked my imagination to say the least. One word about chlorination. I will be using pellets for my treatment as I have done before. I use chlorine pellets to treat my clear water iron problem at home and I brought some out for the past few years to the playa. I had a bucket that was full of greywater that I threw a pellet into before coming home. I forgot about the bucket and a few weeks later remembered it needed to be emptied. Well it had been sitting in the hot sun so I was expecting the worse when I opened it to dumb. It was crystal clear. All sediment was at the bottom bleached perfectly white and it didn't smell at all (except the chlorine). The pellets I am talking about are 3/8 inch diameter, real small for our automatic dispensing system. Look up "pellet chlorinators" for more info on the pellets. Just finished my clone evaporator. " Boaters World" http://www.boatersworld.com/product/356970715.htm has a 500 GPH pump for an amazing low $9.99, about the price of couple of margarita's ! It seems to work fine, draws 12 volts 2 amps and they recommend wiring it with a 5 amp fuse. I brought two just to have back up ! My intuition tells me (and some of the above post concur) that the evap. rate has more to do with the surface area than the recirculation rate , as long as you are keeping the mesh cascading with water, I figure that you could get by on 100 GPH pump, conserving battery power, or go to a solar cell system or ???. I won't need to evaporate more than 30 gallons a day, so I went with a small pump, 3 foot diameter by 3 foot high tower, and smaller pool. I was thinking of adding a second smaller diameter circle of mesh and drilling some holes in the plywood dome to allow the water to cascade down it. Or simply wrapping the mesh with burlap so it acts more lick a wick.